An effective budget serves as a road map for your organization's future growth. This course will teach you how to build in contingencies and wisely plan for unforeseen circumstances, making your budget a planning tool with maximum flexibility. You'll see immediate and direct benefits from these practical, hands-on budget principles and strategies. If you think budgets are a dreaded chore, difficult to comprehend and use or not worth the paper they're written on, this seminar is for you! In one day you'll discover practical skills that dispel these common myths about budgets. 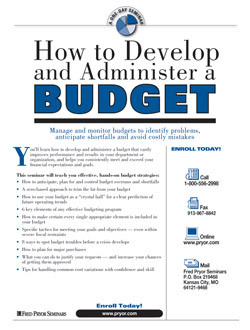 You'll learn how to make and administer a budget that vastly improves performance and results in your department or organization … and helps you consistently meet and exceed your financial expectations and goals. This budgeting course is specifically designed for anyone with responsibilities to monitor costs, plan efficient use of resources and achieve objectives and goals. You will learn how to make a budget and capture the information you need to make intelligent operating decisions with confidence! The budget as a measurement of performance — yours, your staff’s, your department’s and your organization’s. Strategies for controlling expenses without sacrificing flexibility or efficiency. How to convert major planning issues to manageable dollars-and-cents budgets. Solid methods to turn business goals into measurable, achievable fiscal actions. The vital differences in short-term and long-term budgets and how each type guides you to more prudent management decision-making. Capital budgets that generate an expedient rate of return while precisely calculating years to payback. Operating budgets that accurately coordinate every operating area of your organization. How cash budgets maximize profitability and efficient management of resources. How to interpret top management’s fiscal philosophy and what it means to your budget practices and responsibilities. The specific blueprints of different budget approaches and how they incorporate the most important goals and objectives of management. How to organize your goals into a workable framework you can translate into dollars-and- cents budgets. The effect of your major objectives on your budgets, line for line. A step-by-step schedule that works smoothly within your organization’s existing fiscal framework. The specific effects of seasonal factors on your budget. How sound agendas for monthly, quarterly, annual and multi-year budgets point the way for your organization. The vital differences between direct and indirect costs. How costs beyond your control can directly affect your budget performance. The distinctive, different elements of fixed and variable costs. Simple formulas that estimate the impact of unforeseen increases or decreases in either fixed or variable costs. How to set realistic break-even goals within your operational budgets. Ways to minimize the impact of budget variances on long-term profit objectives. How to identify cost-based unit indicators and accurately forecast their impact on your operations. Special tactics for hard-to-forecast, productivity-based unit indicators. Simple guidelines for zero-based budgeting to cut fat and reduce inefficiency. When and how to use average-cost budgeting techniques. Flexible budgeting methods that solve the unusual challenges faced by your department or organization. Simple definitions and formulas that explain average rate of return and years to payback. The key, common elements that characterize a capital expenditure. Depreciation principles that ensure expedient payback of capital expenditures. Specific budget strategies for land and buildings. The 3 types of capital equipment and specific budget tactics for each type. Step-by-step formulas to easily calculate payback. A look at capital rate-of-return with a manageable framework for multi-year capital budgets. When to use discounted cash flow methods to justify capital expenditures. How to interpret the effects on operating budgets of lease and buy scenarios with smart budget tactics for both approaches. Solid advice to determine the advantages and disadvantages of capital leases. The primary importance of the sales budget and how it drives every other budget in your organization. Smart forecasting rules for accurate, realistic sales budgets. Convincing reasons to avoid the antiquated sales budget method of fixed percentage increases. How to weave sales forecasts, marketing plans and sales expenses into one cohesive budget. Plus, produce an actual sales budget in an exciting group participation project. Practical methods to plan for the unknown in cost of raw materials. The many components of manufacturing overhead and how it affects the cost of goods manufactured. Specific pointers that precisely account for cost of inventory. How to employ special merchandise-purchased budgeting techniques for the non-manufacturing organization. Plus, produce an actual manufacturing budget in an exciting group participation project. How to produce a flexible marketing budget with contingencies for market fluctuations and unforeseen competitive factors. Benchmarks and standards for allocating marketing dollars. Practical methods for evaluating marketing goals in concrete dollar terms for budgets. Plus, produce an actual marketing budget in an exciting group participation project. How to determine the best administrative budgeting procedure for your organization’s structure. Proven techniques for evaluating administrative effectiveness and performance through predetermined budget objectives. How to set cost priorities to keep administrative budgets under control. Plus, produce an actual administrative budget in an exciting group participation project. How to maximize investment profits by putting your excess cash flow to work. The importance of recognizing cash shortfalls before a financial crisis develops. A simple formula that accurately budgets cash balances. How the costs of accounts receivable are driven by credit sales. Why you must accurately assess your future financial needs through realistic cash budgets. Plus, produce an actual cash budget in an exciting group participation project.